No one can prepare themselves for a life altering disability. The best you can try to do is gather an understanding of what is going on with your body. We’re glad to share this information and to help anyone going through the condition, with these 11 facts about Leber Hereditary Optic Neuropathy. When Dreamscape founder learned of his disability, he was only 16 years old. Often, we listen to similar stories of those effected by LHON. 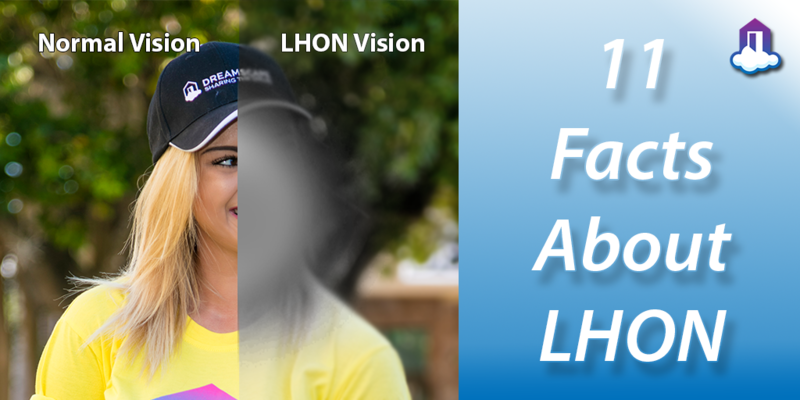 People usually develop LHON mid-late teens, and is described as loss of sharpness and a fading of color vision. The vision loss mainly affects central vision, which is needed for tasks such as reading, driving and recognizing faces. In a small percentage of cases, the central vision loss can improve; but in most cases loss of vision is permanent. It’s only after a year or so living with the disability, is when people fully adapt to their new surroundings. With the help of accessible technology, and charities like Dreamscape Foundation, you too can find the freedom you are looking for! You can rest a bit easier to learn that LHON’s onset is a painless one. The experience on the other hand, can throw quite a curve ball. It only takes a few moments for the central vision loss to kick in, leaving only peripheral view. We often hear stories of rapid blindness, usually after rubbing ones eye. In some cases, one eye will start to be effected before the other. The other eye’s condition soon worsens, at an average of 8 weeks after the initial onset. LHON is still has a cloudy reputation, as most people have never heard of the hereditary disability. It’s a good reminder to know that most of the visually disabled are not 100% blind! This can be a common misunderstanding, due to outdated stereotypes of the blind. LHON is passed down to children primarily due to mutations in the mitochondrial (rather than the male nuclear) genome, and only the egg contributes mitochondria to the embryo. Mitochondria constantly convert energy locked in our food into energy that the cell can use, and are small sub-units that reside within the cell. LHON follows a mitochondrial pattern of inheritance, also known as maternal inheritance. Only egg cells contribute mitochondria to a developing embryo, therefore only females can pass mitochondrial conditions to their children. Fathers affected by LHON or carrying LHON mutations do not pass the condition to their children. This disease was first written and described by the German ophthalmologist Theodor Leber in 1871, only 31 years old at the time. In said paper, Leber described 4 families in which a number of young men suffered abrupt loss of vision in both eyes either simultaneously or sequentially. This disease was initially thought to be nuclear linked but was subsequently shown to be mitochondrial. LHON affects both males and females, but more commonly found in men. The birth prevalence of LHON is approximately 1 in 50,000 people. More than 50% of men and more than 85% of women with a mitochondrial mutation will never experience vision loss. Without a known family history of LHON the diagnosis usually requires a neuro-ophthalmological evaluation and blood testing for mitochondrial DNA assessment. In 1988 Wallace et al. identified the nature of the first known causative mutation (50-70% of all LHON cases). The other two mutations known to cause LHON were identified in 1991 (8-25% of all LHON cases) and 1992 (10-15% of all LHON cases).